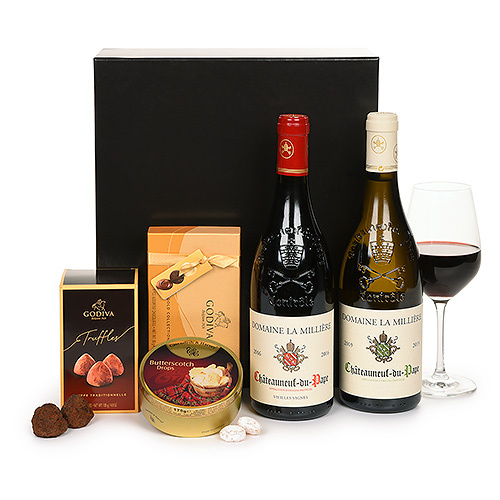 Express your appreciation for colleagues and clients with our best-selling Hospitality Tray wine gift box. The VIP edition features two superb bottles of Châteauneuf-du-Pape French wine, one red and one white. These full-bodied wines are created by Domaine Raymond Usseglio & Fils from the Southern Rhône Valley. The wine duo is paired with a discovery box of lucious Godiva chocolate truffles. Tempting Godiva Orangettes - juicy orange peels dipped in rich dark chocolate - and a tin of classic European butterscotch candies complete this impressive business gift. Send the VIP Hospitality Tray to say "thank you" or "congratulations" to important colleagues, clients, and business associates. It makes an equally memorable gift for dear family and friends.